Until last week, I didn’t know I was an Anglican. In Britain, the Church of England by and large is an object of humour. We joke about its reputation for tea and cake, leaking roofs and village fêtes, its desperate, undignified attempts to be trendy and current, the notion half its members are private atheists. The latter always seemed a comic overstatement, but unearthing my certificate of baptism has made me question its exaggeration. As long as I was seriously conscious of religious ideas, or indeed much else, I never considered myself an Anglican. While at one time or another I visited most local churches, it wasn’t the Church of England in which I grew up – I’ve only the vaguest memory of visiting its services at preschool age, after which I never went back. By the time I was sixteen, in any case, I was an atheist. 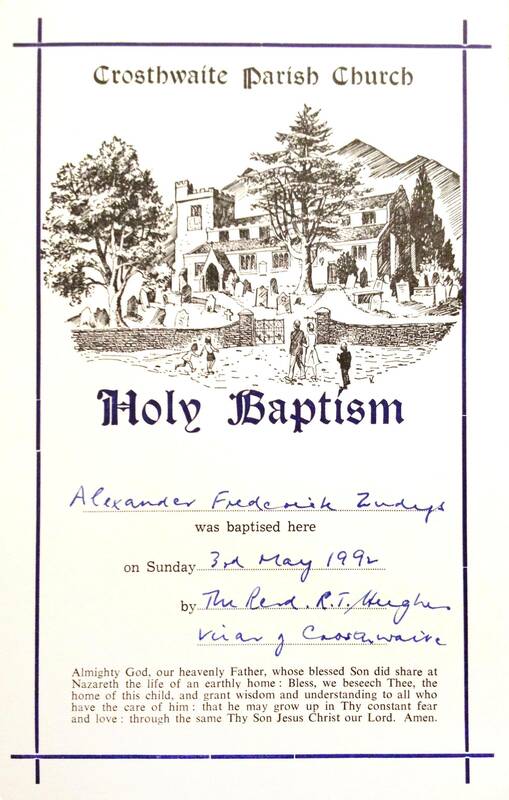 It’s uncanny then, almost archaeological, to have found record of my Anglican baptism while rifling through old results letters and legal papers, a yellowing sliver of card from the first months of my life. Its centrepiece is a line drawing of the churchyard, a man and woman gendered in 1950s dress outside its gates, arms linked, a boy behind them carrying something – a hymnbook, perhaps? – and two girls skipping in ahead, their angle of approach suggesting a separate family, their parents out of view behind them. The gates have been altered in the years since this was drawn, and I wonder if the artist (their signature only a subtle ‘V.’) is still around: the image speaks of a time when still-young parents brought their children to churches like this, when boys wore blazers and trousers and girls pleated skirts. Even if this was drawn the year of its issue, the artist must have been at least sixty-something – the current age of my parents, till recently some of this church’s youngest members. Asked to think of churchgoers, at least in a parish like this, would anyone born since the war picture such figures? Almighty God, our heavenly Father, whose blessed Son did share at Nazareth the life of an earthly home: Bless, we beseech Thee, the home of this child, and grant wisdom and understanding to all who have the care of him: that he may grow up in Thy constant fear and love: through the same Thy Son Jesus Christ our Lord. Amen. The gendered pronouns catch my attention. Did female-assigned babies have separate certificates, worded ‘her’ and ‘she’? Did the blessing’s content change? I can’t see why it would, but nor do I see an existing need for ‘his’ and ‘him’. Perhaps ‘s/he’ just seemed too drily official, but in some ways this is true of the whole document. If only because uncovered among wildlife awards and first aid diplomas, this certificate seems jarringly unprofound next to its subject matter, a collision on bordered card of the ostensibly transcendent with the palpably banal. What about the hope, then, that I grow up in constant fear? I’m braced for the objection that the full text reads ‘fear and love’, but I’m unsure that’s an improvement: if you live in fear of someone, I worry for you, but I worry much more if you love them as well. It’s certainly revealing though that here, as in this church generally, sinister details lurk in the fine print. Whatever affectionate fun Eddie Izzard and Rowan Atkinson poke at it, the Church of England does not deserve its mostly harmless image. If its sheen of middle class friendliness has been eroded by its handling of gay marriage and women bishops, its years of misanthropic collaboration through the Anglican Communion have gone largely unnoticed in British media. If Justin Welby cares as much as he claims about gay people’s wellbeing, what does he have to say to the Church of Uganda, supporters by and large of its country’s Homosexuality Bill, smearers of queer men as molesters of infant boys with talk of ‘homosexual disorientation’, excommunicators of pro-gay bishop Christopher Senyonjo, boycotters of the 2011 Primates’ Meeting? Where was he while his predecessor, seemingly comfortable in such churches’ company, spent years appeasing Peter Akinola, former Nigerian archbishop and supporter of criminalising homosexuality – even defending his implied threats toward Muslims? If this is a church of closet agnostics, it’s also the church of Andrea Williams, George Carey and Lynda Rose; of Nicky Gumbel, John Sentamu and Michael Nazir-Ali. In both confidence and influence, the fundagelical factions are growing – we’re seeing (or almost seeing) ex-gay bus ads and pro-life rallies, watching young Earth creationists gain major politicians’ ears while secular, pro-choice MPs are unseated in smear campaigns, theocrat lobbyists win unjust, unfair legal exemptions for religion. This church’s standards are as hole-filled and unsound as its proverbial roofs, and – thanks to my infant baptism, carried non-consensually out before I could speak, and in terms of figures widely used by the media and government – I’m one of its members. Time and again the Church of England has brandished favourable statistics, no matter how spurious or unreliable, in attempts to legitimise its privileges. In the decade which followed the 2001 census, we heard over and over that 72 percent of Britons were Christians, despite this resulting from an imprecise leading question and being wildly inflated in comparison with other national surveys. After the 2011 census, despite the figure dropping to 59 percent and ‘no religion’ answers rising from 15 to 25 percent, the Church claimed victory – only for polling to show that out of those who’d declared themselves Christians, half never took part in any religious activity (including church services) and hadn’t read any part of the Bible in the previous three years, with only slightly more saying they explicitly believed in God, almost 40 percent never or almost never prayed, only 35 percent could name the first book of the New Testament and only 10 percent looked most to their religion for moral guidance. I don’t think my anger at being baptised, then, is trivial or insignificant. When next the Church of England lobbies for further control of state-funded schools, the preservation of schoolchildren’s duty to participate in Christian worship and of its bishops’ automatic parliamentary seats, continued status as the country’s established church or any other theocratic entitlements, you can bet its many millions of supposed members – most of them inducted, like me, sans knowledge or permission – will be hoisted in its support. However the data’s used, anyway, isn’t registering non-consenting people as members of your church just wrong? As so many times before, I feel the spectre of the petty, whining atheist being aimed at me, but once again, aren’t atheists as entitled as believers to autonomy and respect? So while there’s little I can do to reverse its effects, the Church having refused to discount defectors from its membership, I renounce my baptism. Actually, I denounce it. I denounce a theism I’m incapable of holding to be true, and any theism that imports existential fear, guilt or shame; I denounce a church which preaches that fear to infants, commanding them to love its imagined source, and which harbours and appeases those who’d deny me human rights or dignity. In particular, I denounce a church that takes ownership of children’s minds for granted, and which claims them as its members before they can speak. Since my first months on this planet, to my recent surprise, I’ve been an Anglican – I was made one without my assent, and most likely will stay one forever, at least on paper, against my will. For that reason if no other, I wish passionately not to be.